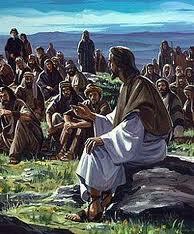 Jesus the Teacher research papers overview the teachings of Jesus according to the Gospels. Religion research papers about Jesus as a teacher can be custom written from the theology writers at Paper Masters. Any type of religion research paper can be custom written and received from on our writers as a rush order or within the time-frame you specify. Jesus taught the beginning of the Kingdom of God. The New Testament uses about one hundred and thirty titles to describe Jesus: Christ, Lord, King, Lamb of God, rabbi, Son of Man, Son of David, Son of God, being the most frequent. “Teacher” is used about fifty times in the Gospels. Albert Schweitzer was moved to call Jesus, “The Great Teacher” in his accounts of Jesus’ life. As for Jesus, who did He say he was? After Jesus fed the five thousand (John 6.31), he said that the true bread, the bread which gives life and defeats death must come from God (John 6.32). Then comes his own claim: “I am the bread of life…I am the living bread which came down from heaven (John 6.35,48,51). Jesus the Teacher term papers note that Jesus was saying something that the Jews bitterly opposed; they thought that they knew who Jesus was, and they could not see how any one of whom they regarded as a familiar person had the right to talk like that. Jesus’ teaching was not founded upon the traditions of man or the teachings of man. It was founded entirely upon the revelation of God. Its source was God and God alone. Because of this He could say, “My teaching is not Mine, but His who sent Me,”(John 7.16). The naming of God as Father was not new with Jesus. Long ago Israel, believing that God had elected her as his special people, had thought of herself as the first-born Son of God (Exodus 4.22-33), and elsewhere God is called the Father of Israel (Jeremiah 30.9). Many Teachings of Jesus term papers maintain that Jesus brought the Fatherhood of God to the very center of his message, and presented it not as a truth inherent in the past history of the Jewish people, but as an event of God’s grace that could only be responded to and appropriated in and through his words here and now. Paper Masters writes custom research papers on Jesus the Teacher and overview the teachings of Jesus according to the Gospels.